Many users back up their browser’s profile and keep a copy of their bookmarks, extensions, etc from time to time to prevent data loss in case of browser failure or other technical problems. Navigating to locate for relevant directory where the browser keeps the profile files can be quite tedious especially for non-technical users. Many users probably do not know that Firefox browser has incorporated a new support page in the latest Firefox 3.6 which makes profile navigation, backup, and browser troubleshooting more straightforward and easier. Firefox 3.6 has added a new page, namely support, to assist users and troubleshoot problems if users encounter any. To go to the support page, users just need to type about:support in their Firefox browser’s address bar and hit enter. Users will get a list of useful information about their browser from the support page. Users will be exposed to three main categories of information: Application Basics, Extensions and Modified Preferences. 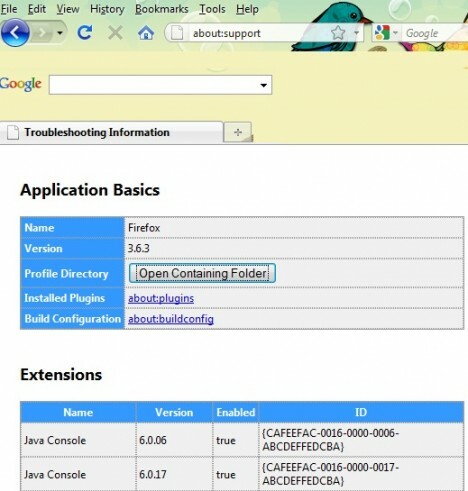 From there, users can check out their profile location, Firefox version, important application, extensions installed, etc. Based on the information listed in the about:support page, users can have a better idea about the browser component they are using and undertake to troubleshot if they encounter technical problems. 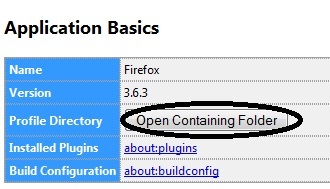 Users can go to their profile folder in the Windows by clicking on to the “Open Containing Folder” button under Application Basics section. This will open up the profile folder and allow users quick access relevant sub-folders to back up their setting or the sub-folders themselves. Users can check from the Modified Preferences section all the configuration parameters that have been modified and altered by users. This information will help users to go to the root of the browser problem (if any) and troubleshoot it accordingly.